Jean-Luc Almond is an artist fascinated by paint itself. 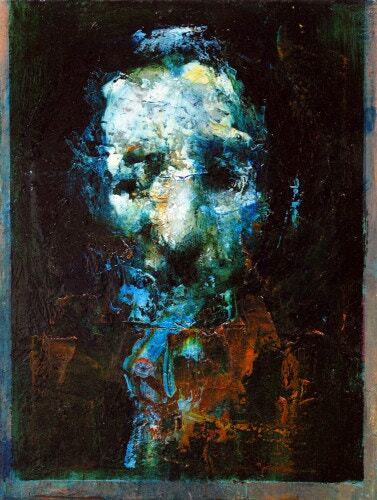 Since studying BA Painting at City & Guilds, he has been working in his studio in Bedford, making his half abstracted, otherworldly portraits that are thick with brushstrokes and abstracted colours. He was a part of the National Open Art Exhibition this year where his painting won The Big Prize from Cass Art: a day shadowing an artist of his choice, as well as a commission. We met him at our Islington Flagship to talk about his painting practice, why he finds it hard to pick up a pencil, and his exploration of the human face. How long have you been painting, exactly? And what’s your process? I was always drawing when I was younger. I was scared of paint because I didn’t want to get my hands messy but now I’m the complete opposite! I’m obsessed with paint now – I find it hard to pick up a pencil because I find it so rigid. I just love the fluidity of paint. All my preliminary sketches are made with ink, sometimes charcoal, and the final painting never looks like those original sketches. Part of my process is finding out whilst painting. I’ll make multiple paintings on top of each other and scratch back the layers – it’s all about damage and chance. My subject matter is collages of found images, and I put them all up on my wall. But then I might take a photo of a resulting painting, manipulate it digitally and then work off of that. It becomes a new subject matter, and my work is about that push-pull tension. I do always go back to the face. There’s something so intense about it that I can’t capture elsewhere. I’ve painted full scale figures before but they don’t have the same intensity. I generally build up an image but it reaches a stage where I become bored with it. I find painting more fascinating when it’s on the verge of breaking; it feels more alive. Unintentional marks are interesting – I couldn’t have envisaged them so it’s not just about portraiture, but about paint and becoming something. The whole process is about manipulating an image over and over until I find a presence. Which art materials do you use most regularly and why? The purity of colour in Michael Harding oil paint is just brilliant. I like the feel of it; it’s got a very silky texture which is beautiful. I like using traditional colours alongside toxic, artificial ones, so I’ll often work in umber but then add weird pinks and lime greens. And I use alkyd medium to build up texture – it gives me this cement like quality when I use a palette knife, and sticks to the surface in a weird way. Who would you say your artistic influences are? I’m inspired by the work of Francis Bacon. It’s been said about his work that something figurative relates to the illustrative, but something figural just becomes. A blob of paint can become a nose, for example, like with Rembrandt’s work. 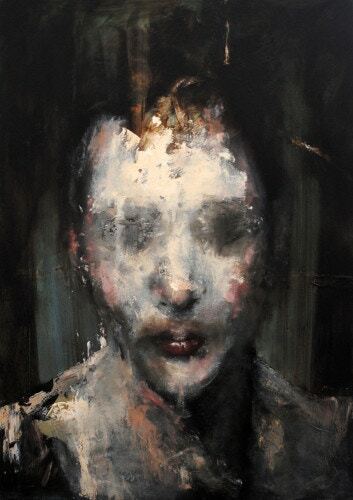 And I love Justin Mortimor’s work, it’s a bit more representational, but the collage and damage of the image is really evident in Adrian Ghenie’s work. What other opportunities has the National Open Art competition opened up for you? I entered at the last minute, thinking I’d never get in. I entered five last year and none of my paintings got in, but this year I tried to be more true to myself and chose one painting that I felt reflected my style most. It was great to get in and it’s opened many doors because people have been contacting me since the exhibition. It’s been a really nice experience. Do you have any plans for your Cass Art commission yet? Or is it still under wraps? I’ve started making a new series recently that’s quite different – it’s normally all about adding, but these are about obliterating. I’ve been using ink and bleach, and the bleach eats away at the ink. It’s a really quick way of working. But for the commission, I’m still playing around with ideas. I’m thinking of making a larger painting and emphasising collage elements. Or perhaps making a collage of loads of different portraits and creating my own face, messing it up with Photoshop. I like using Photoshop because I can add random shapes, working off that abstraction and formal device, which is completely at odds with the technique underneath – and then I can choose specific colours, and play around with it. Visit Jean-Luc Almond's website here. Shop for the Michael Harding oil paints that he loves to use here.